Offering palatial interiors and a tranquil ambience, Hotel Anjani is indeed one of the most luxurious hotels situated in the heart of Udaipur - The City of Lakes. Being the royal palace of Seth Naga Ji Kapoor Chand Shah, the building was known for its Mewar architecture and rich décor, making it a centre for art, culture, and harmony. In 1990, the palace was converted into a luxury hotel, offering the perfect blend of Indian hospitality and modern day conveniences. Overlooking the tranquil Lake Pichola, the hotel offers an ultimate in privacy, serenity, and relaxation for the guests. 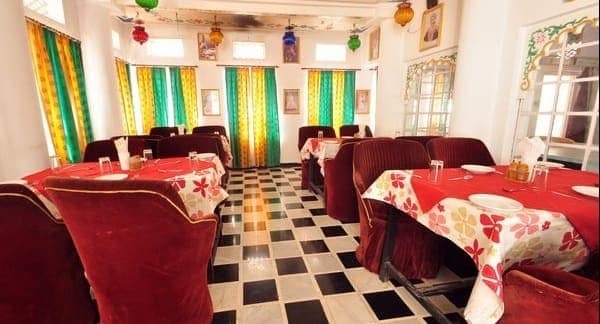 The hotel is situated in Gangaur Ghat and is just a few miles away from prominent tourist attractions including Bagore Ki Haveli, City Palace, Jagdish Temple, and more. The railway station is situated about 3 kilometres away from the hotel, while Maharana Pratap Airport is about 24.1 kilometres away from the hotel. Breakfast Services, Conference Hall, Backup Generator, Laundry Facilities, Concierge, Internet/Wi-Fi, Complimentary Newspapers in Lobby, Baggage Storage on Request, Front Desk, Disabled Facilities. H/C Water, Balcony / Terrace, Desk, Complimentary Toiletries, Wakeup Calls, Shoe Shine, Cable/Satellite TV, Child Care, Dustbins, Makeup / Shaving Mirror. User reviews for "Anjani Hotel Udaipur"